moulds in half. Cook in Slow heat . Flip the panniyaram with a stick (I used the grill stick). Serve hot with Chutney. Note: I used the leftover dosa batter. But my mom makes Paniyaram with a batter specially ground for it. I guess it has more urad dhal proportion to make it spongier. 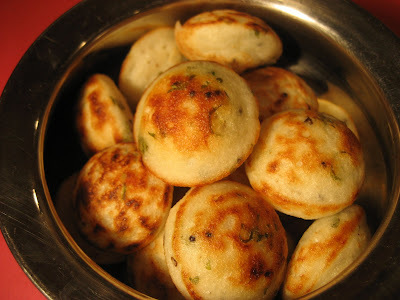 Really Kuzhi Paniyaram Pictures are mouth watering.Actually I am looking for the receipe.But can u tell me how much should be proportion of rice and urad dal for making the batter?And tell me what chuttney goes with it?? ?